The Chess Hotel offers a wide range of services and equipment to ensure its guests have the most enjoyable and truly relaxing stay. The Chess Hotel is also pleased to welcome external clients, whether it is for a breakfast, a cup of tea, a cocktail or a glass of Champagne, accompanied by a plate of Da Rosa delicious savory snacks. Day and night in your room, or in the lobby until 11pm, discover the tasty products selected by José Da Rosa, which combine unique flavors and authenticity of Italian, Spanish and Portuguese gastronomy. For a tasty meal, also discover the famous dishes and delicacies of Bocaux du Bistrot. During your stay with us, benefit from a special and exclusive rate to access the very chic sports club "L'Usine" - a fitness, sport and well-being hub located just 250 meters away from the Chess hotel. In one day, you can take part in a class or simply enjoy the facilities (sauna, steam room, etc.). During your stay with us, enjoy a favored access to the wellness area of Le Roch Hotel & Spa, our group’s 5 stars establishment designed by Sarah Lavoine. Offer yourself a wellbeing break by booking a customised treatment for face or body at the spa Codage, just a few minutes’ walk from the Chess Hotel. For any purchase of a treatment, enjoy one hour access to the hammam and the magnificent swimming pool of Le Roch Hotel & Spa. Experience Paris, capital of gastronomy, art and fashion! Our team is up to date on all the events taking place in Paris to help you organize a successful stay and answer all your needs. Transfers and chauffeurs: We can arrange all your trips and transfers as well as a chauffeur-driven car tour of Paris. 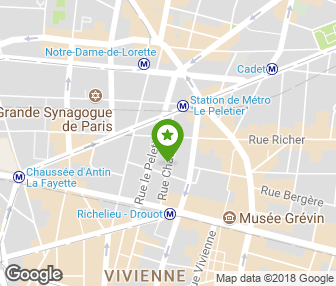 National Museums: By buying your « Paris Museum Pass » at the Chess Hotel, you gain free entry without queuing and as many times as you wish to over 60 museums and monuments in and around Paris. Take advantage of our "Paris Museum Pass" to maximise your cultural experience! Gastronomy and culture: Our concierges will be delighted to recommend you the best shows, exhibitions and restaurants in the capital, and will always have the great tip to satisfy your needs. Personalised welcome gift: Delight friends and family by arranging to have flowers, chocolates, fruit, wine or champagne delivered to your room or suite before arrival. Child minding: Whether it is for an evening, an afternoon or a whole day, we can provide child minding facilities. We work with a state-registered agency only employing experienced multi-lingual childminders. Dringme: Stay connected round the clock with this mobile phone (given to you free of charge), and live Paris as if you were a real Parisian with the City Guide and concierge service! Children and babies are more than welcome in our property. To comfortably accommodate families, we have at your disposal connecting rooms. For the youngest, you may require a baby-cot, a changing mat, a high chair or a baby-bathtub. Come and join us at The Bar, whether it be for a relaxation time or a work moment. Our barman is at your disposal from 3pm to serve a large selection of drinks and cocktails in the lobby, in your room or on the terrasse located on the level A2. You may also choose to savour or share a plate made up with the Da Rosa delicacies listed on our menu. For the greatest wine lovers, enjoy a glass of grand cru served in a few seconds at the perfect temperature thanks to the "D-Vine" - wine by the glass tasting machine. Stay connected with the different services available in our hotel: complimentary Wifi access in the rooms and public areas, USB and HDMI plugs in all rooms, iPad at your disposal at the reception, printer on request. To reserve a meeting room or organise a seminar simply talk to our Concierge to book the Emergence room located just opposite the hotel. Thanks to our partnership with Interparking and the underground parking Chauchat-Drouot situated in 500m of the Chess Hotel, you can enjoy privileged rates for 1, 2 or several days (from 25€ for 24 hours).